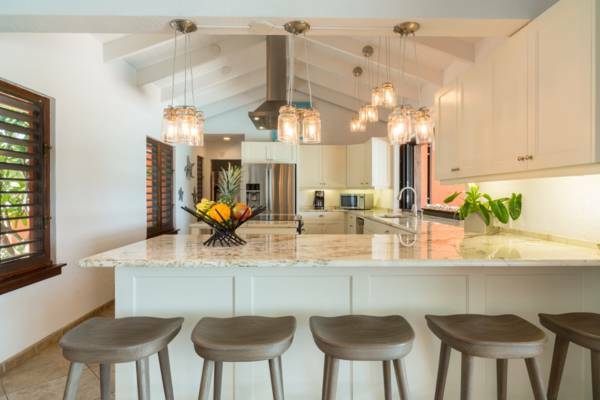 A private Turks and Caicos luxury retreat, Five Turtles is a newly refurbished 4 bedroom luxury villa which sits directly on one of the Island’s most beautiful beach coves – Sunset Bay (a/k/a Taylor Bay). 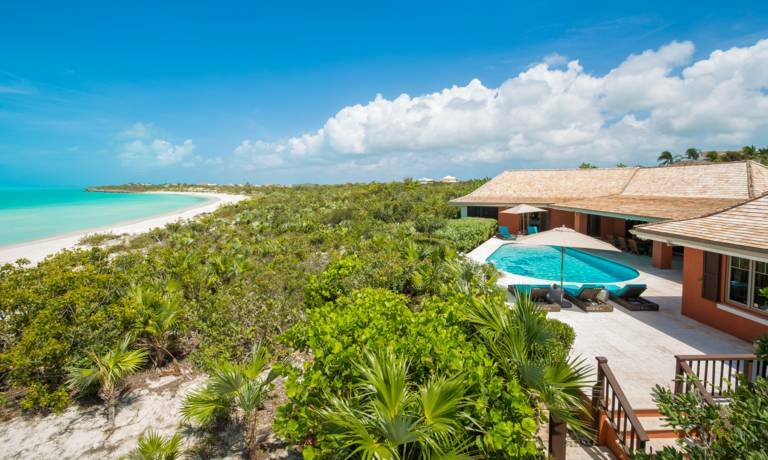 This refined four bedroom luxury retreat is located on the South West Side of Providenciales in the prestigious area known as Sunset Bay in Turks and Caicos. If you must leave, a 15-minute drive takes you to Provo’s resort area, restaurants, shopping and attractions. 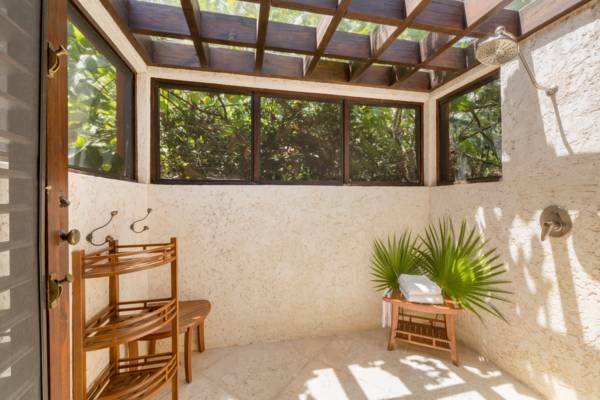 Private tennis courts (available to guests) are a 2-min walk along the quiet street. 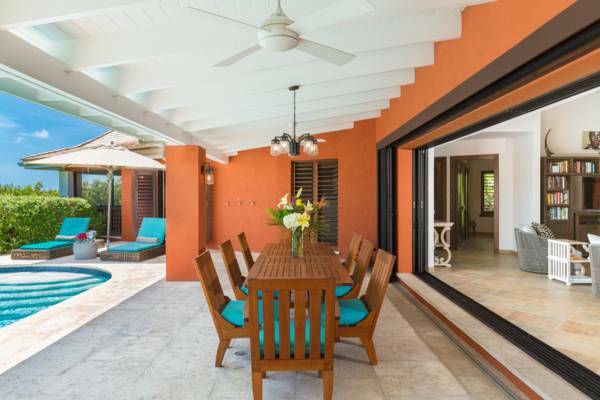 This charming home offers guests all the comforts and amenities one could desire. 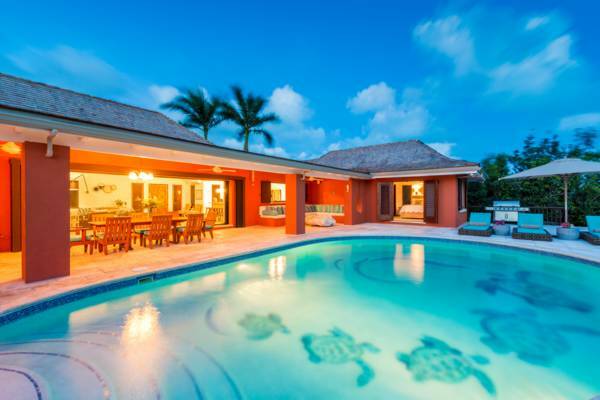 A large free-form pool – featuring 5 Turtles of course – elegantly appointed interiors, and gardens wrapped in the privacy of colorful shrubbery and native vegetation. 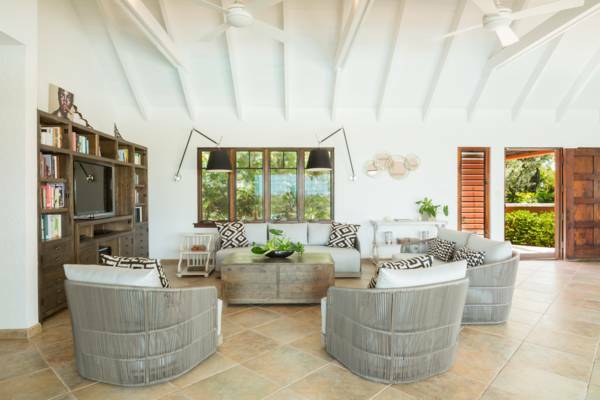 The great room is equipped with plasma TV, DVD/CD, VCR and IPod dock, and opens via retractable wall-to wall sliders to a spacious outdoor living-dining area at poolside. 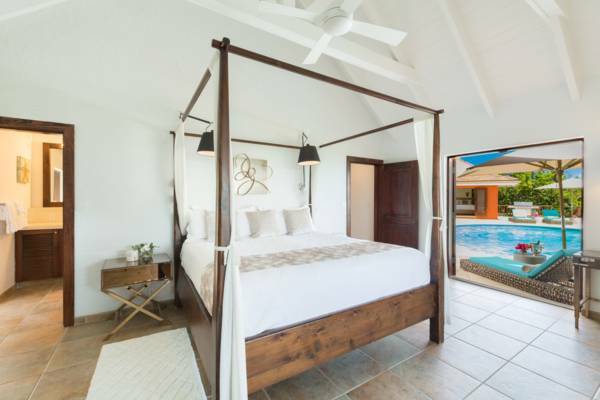 Two bedrooms are located on opposite sides of the central living area and kitchen: The master bedroom consist of a king size 4-poster bed and large master bath. 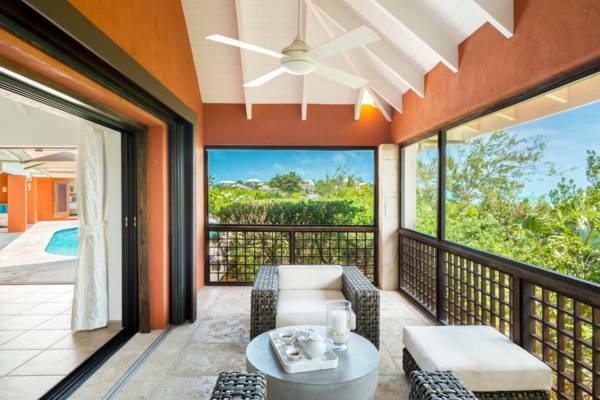 Imagine yourself in this Turks and Caicos Luxury retreat for bathing under the sun or stars, step into its screened outdoor shower, then relax in the suite’s private screened patio. 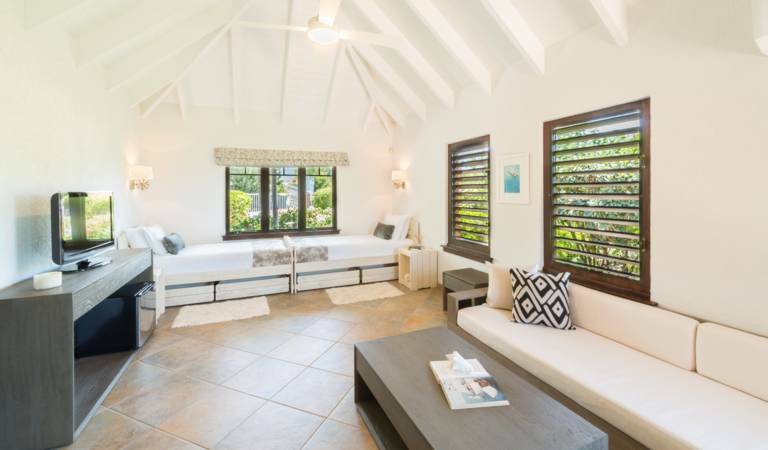 Beside the master suite you will find a Queen bedroom with ensuite bathroom. 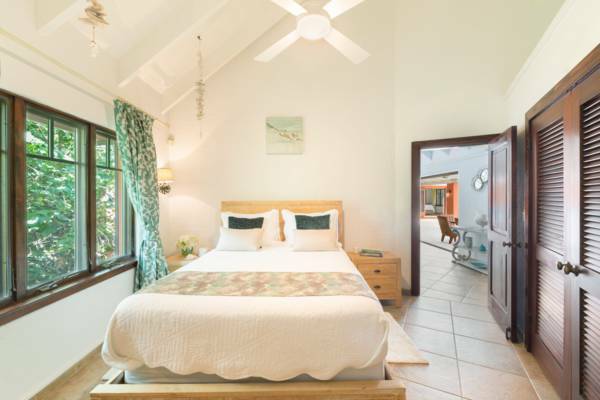 Opposite wing houses an ocean-front King bedroom, and a twin bedroom facing the gardens. 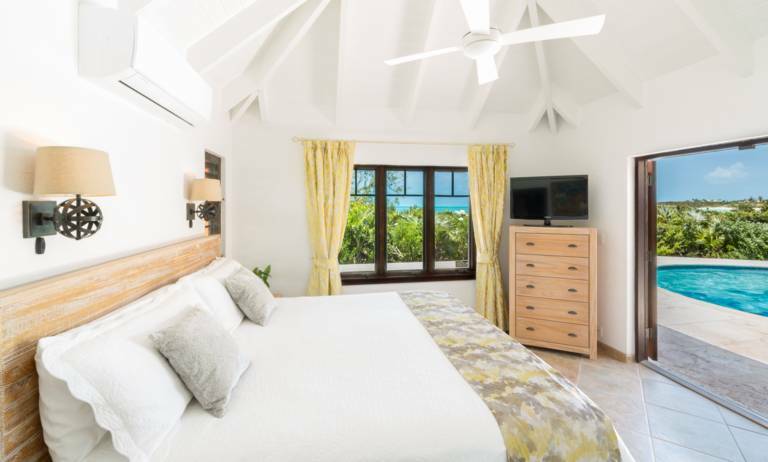 All bedrooms are air conditioned. 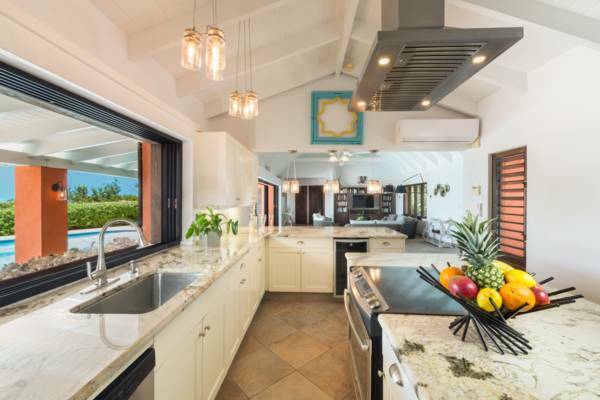 The state-of the art kitchen with granite counter tops, integrated stainless steel appliances, and full range of small appliances will not disappoint even the most discerning chef. 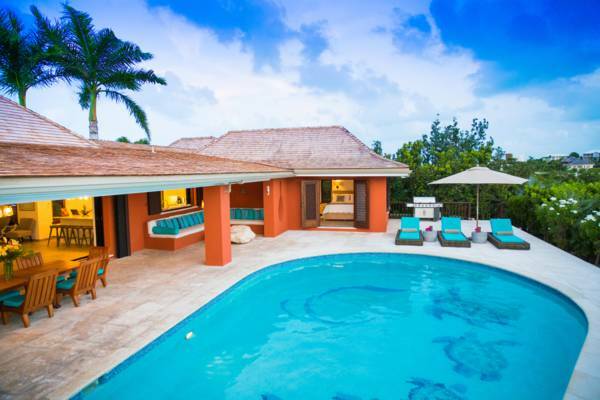 Five Turtles luxury retreat is mere steps from poolside to its delightful white sandy beach. Here, the shallow, calm and translucent water make it particularly safe and playful for small children and adults alike... And did we mention the fabulous sunsets?!? 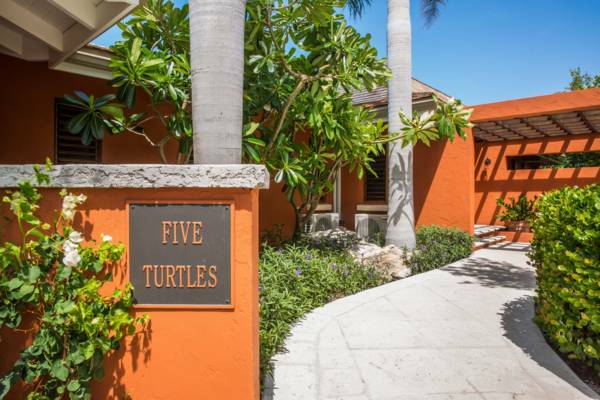 Five Turtles is an incredible home in the most beautiful place imaginable. The way the home was built is very impressive - perfectly designed for its setting with outstanding functionality. And of course you are a dozen steps away from the most idyllic postcard view of turquoise water from under an old, beautiful beach pine. When I die, I want to go here. Our visit to Five Turtles was a fun time! Taylor Bay Beach is the perfect setting for small children. The villa itself was very accommodating. Although we wish there was A/C in the common area, it didn't damper our fun . Everyone at Island Escapes was very friendly and easy to work with. George the beach dog spent a lot of time here with us as to others had mentioned and we enjoyed it a lot. From Turkey to Nigeria to Hungary to Washington DC...we enjoyed our holiday at Five Turtles Villa! This was truly one of the most peaceful areas my family and I have travelled to. As a graduation gift to my big brother it was a memorable vacation. From snorkeling to admiring iguanas, we experienced many new things. Besides all that, the turquoise water was breathtaking. I hope we come back soon. First time at Five Turtles Villa and third time on the island. First for my sister, daughter and her friend. By far, the best location I have stayed so far. 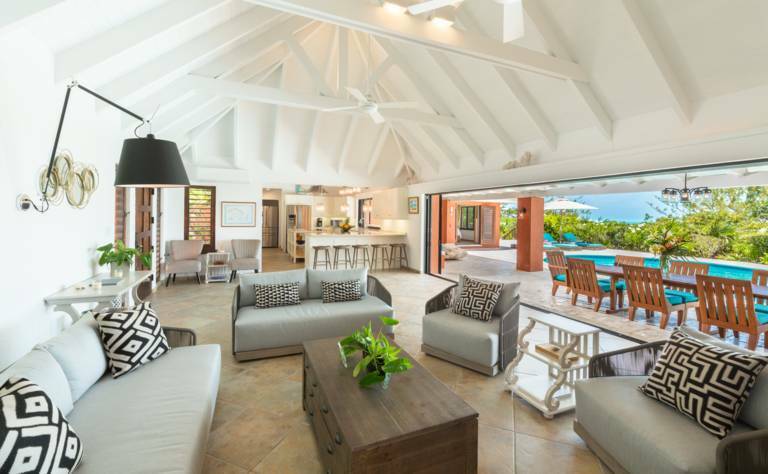 The villa was perfect. We loved the pool, the beach and the house. The bay and water were amazing. 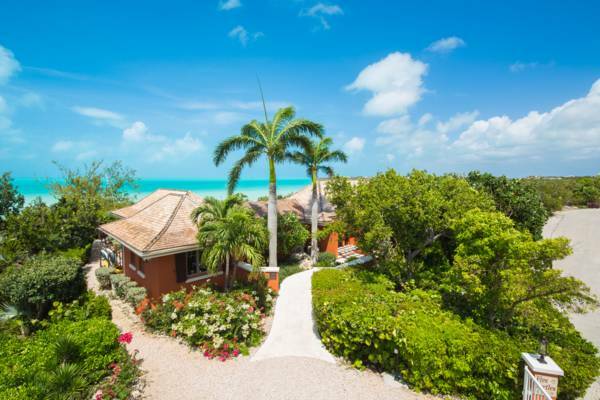 I liked it much more than Grace Bay. Much less people and off the beaten path. We had most of our meals here at the villa and the kitchen was stocked with everything we needed. We drove and used Virgil Taxi and Virgil was an angel. Such a kind and interesting man. Provo Turtle Divers took care of us on our dives. They were amazing. James took us jetskiing - so much fun! Island Vibes Tours took us on a day boat trip - private and amazing!!! It was all wonderful and we will be back.